Industry Experts, Inc. published an updated 2018 version of its global market report on Cord Blood Stem Cells. As per this new report entitled “Cord Blood Stem Cells – A Global Market Overview“, Cancer remains the largest application market, reaching a projected US$21.4 billion by 2022 from an estimated US$8.1 billion in 2017 for the period 2017-2022 closely followed by Blood Disorders. The Cord Blood Stem Cells collection process is straight-forward, non-invasive and is painless for both mother and child. Once stored, the treatment can be availed at any point of time. These cells are potent than adult stem cells and are not exposed to environmental pollutants, chemicals and other viruses. Cord Blood Stem Cells are flawless match for child, siblings and other family members. The study analyzes the market for Cord Blood Stem Cells technologies including Stem Cell Transplant, Cord Blood Banking, Blood Transfusion, Cell Based Genetics and Xenotransplant while key application areas comprise Cancer, Blood disorders, Metabolic Disorders, Immune Disorders, Osteopetrosis and Others. Global Cord Blood Stem Cells market is expected to witness a robust CAGR of about 25% during the 2017-2022 analysis period and projected to reach US$63.8 billion by 2022 from an estimated US$20.9 billion in 2017. 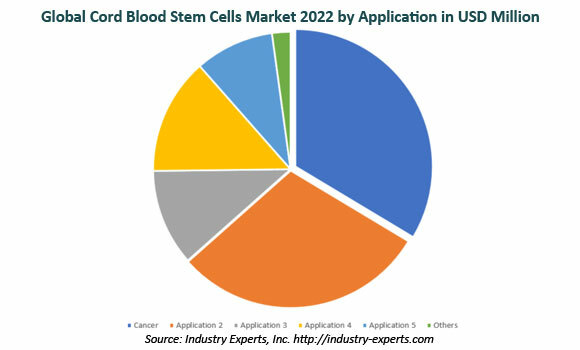 The market for Cord Blood Stem Cells is segmented into four major global regions namely, North America, Europe, Asia-Pacific and Rest of World in terms of value in USD for 2014-2022 analysis period. The regional markets further analyzed for 15 more independent countries across North America – the United States, Canada and Mexico; Europe – the United Kingdom, Germany, France, Spain, Russia and Switzerland; Asia-Pacific – India, China, Japan, Australia South Korea and Singapore. This 302 page global market report includes 176 charts (includes a data table and graphical representation for each chart), supported with meaningful and easy to understand graphical presentation, of market numbers. The report profiles 45 key global players and 64 major players across North America – 30; Europe – 11; Asia-Pacific – 20; and Rest of World – 3. The study also provides the listing of the companies engaged in cord blood stem cells. The global list of companies covers the address, contact numbers and the website addresses of 412 companies.